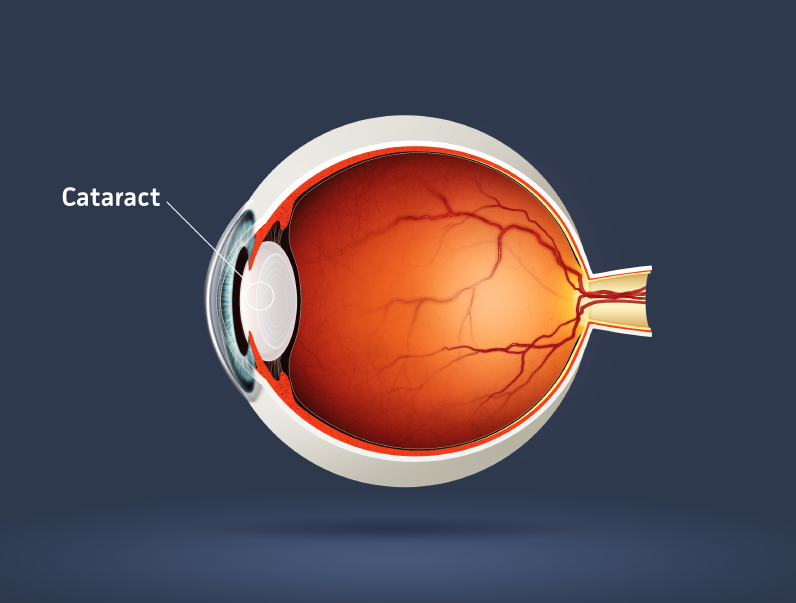 Cataract is the medical term given when the natural lens of the eye become cloudy. 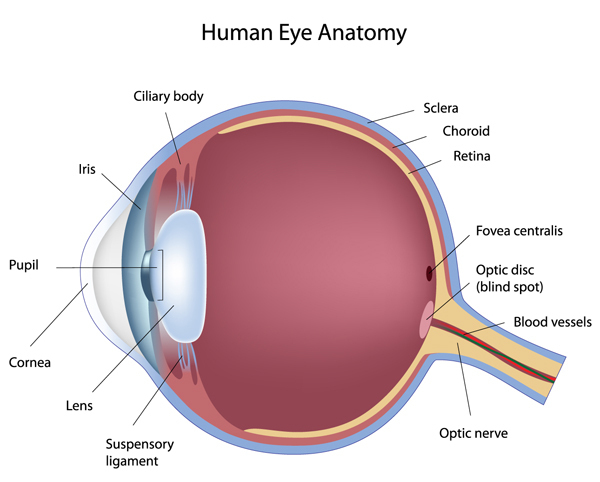 The diagram below (C1) illustrates the basic anatomy of human eye. The light rays enter the eye through the cornea, front window of the eye, and pass through the lens towards the retina (B1). The retina contains light sensitive cells known as photoreceptors and these cells ‘process’ this information in such a way that we can see the world around us. 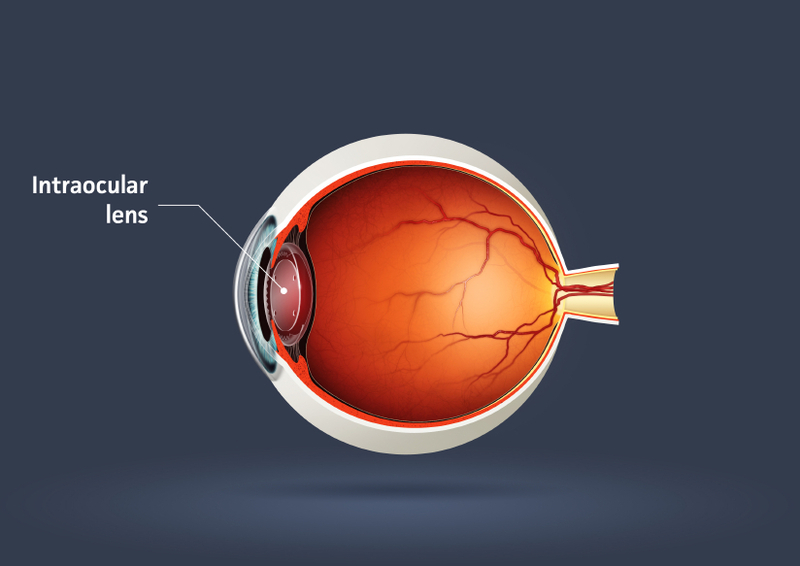 The cornea and the lens carry out the process of focusing the light rays towards the retina. Therefore any clouding in the lens will degrade the quality of this information reaching the retina, resulting in reduction of vision, glare and depreciation of quality of colours. Cataract (B3) is often diagnosed as an incidental finding when the patient visits an optician for a routine eye exam. Cataract is a common and important cause of visual impairment world wide. The commonest cause for cataract formation is due to age but other causes include trauma, diabetes, certain medication and history of inflammation in the eye. Cataract extraction accounts for a significant proportion of the surgical workload of most ophthalmologists and it continues to be the commonest elective surgical procedure performed in the UK. Do I need to have cataract surgery? No. 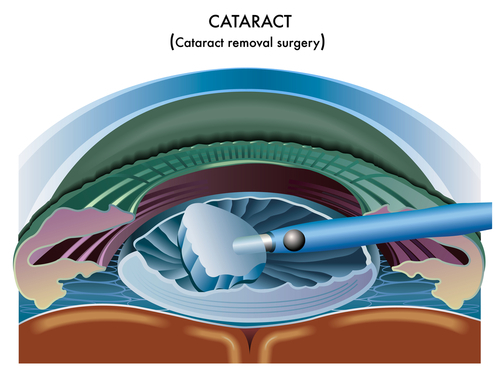 It is not harmful to leave a cataract once you are diagnosed. Cataract surgery is only indicated when the vision in your eye is decreased such that it interferes with your everyday life. The threshold for cataract surgery is different amongst different patients. How long does the surgery take and what kind of aneasthetic will I have? Nowadays with improving technology, cataract surgery is performed as a day case procedure. Removal of cataract and replacement of the lens normally takes between 15 to 20 minutes. Mr Kashani tends to perform majority of his cases under topical aneasthesia. This type of aneasthetic uses strong drops to ‘numb’ the eye and it works very well. Of course for those whom are of a nervous disposition, other types of aneasthesia including subtenons (injection around the eyeball), sedation or general aneasthsia can also be employed. The main advantage of using topical aneasthesia is faster recovery post operatively with minimal discomfort to the patient. Mr Kashani will discuss provide a list of precautions after surgery with a number to call in case of any questions. During cataract surgery, we make a small cut in the cornea to access the lens. Viscoelastic agent is used to create space in the anterior chamber of the eye (B6). A circular cut is made in the front part of the bag which is holding the natural lens. Using ultrasound energy the lens is ‘emulsified’ and removed leaving the back part of the bag intact, ready to have the new lens in place. The bag is then polished and the new artificial lens (B4) is placed in its place. The viscoelastic material which was employed to inflate the front chamber of the eye is removed and the wound is hydrated to prevent leakage. Under normal circumstances we don’t place any sutures in the cornea. Finally antibiotic is injected in the anterior chamber to minimize risk of infection. Will I get a cataract again? No. The surgery will never need to be repeated as the natural lens is removed and a new implant is placed in the eye. However in a significant portion of patients, the bag which holds the new lens can become opaque over time causing similar problems to when the cataract was originally present. With the new lens designs, the risk of capsule opacification is reduced. Luckily the treatment for capsule opacification is extremely quick and simple and involves laser in an outpatient setting. How long will I need off work and how quickly will my eye take to heal? This depends on your occupation however in general, Mr Kashani advises patients to have 2 weeks off work following surgery if possible. Am I going to be admitted to hospital overnight? No. Cataract surgery is a day case procedure and patients are discharged 30 minutes following surgery. If we have used sedation or general aneasthesia then the aneasthetist will advise you about discharge but again in the vast majority of cases patients are allowed home the same day. If we are operating on your only good eye (i.e you cannot see out of the non-operating eye), then you may want to arrange someone to stay with you for few days until your vision recovers. By far the most catastrophic risk is infection inside the eye which thankfully is rare (less than 1 in 1000). Other risks include bleeding, rupture of the back capsule, dropped lens and retinal tear with or without retinal detachment. These other complications may require further surgery to improve vision. Although this list is not exhaustive, the great news is that cataract surgery is normally straightforward with over 98% success rate. I am often asked this question after the patient has had surgery. The answer depends on the health of your other eye. If your non-operating eye has good eye sight with no other problems then you can drive a normal sized car (please see DVLA guidance – https://www.gov.uk/driving-eyesight-rules) when you feel comfortable to drive. If you have any problems with the non-operating eye, it is best to wait until your post-operative appointment. Will I need glasses afterwards? Intraocular lenses that are available on the NHS are monofocal in their function. This means that the lens implant can only correct farsightedness (hyperopia) or shortsightedness (myopia) and not both. These lenses also don’t address the issue of pre-existing astigmatism in your eye. Astigmatism in simple terms means that the curvature of the cornea, the front window of the eye, is not a perfect curve and is irregular. The eyeball in people with astigmatism is shaped more like a rugby ball rather than a football. Thus if there is no or minimal astigmatism, a monofocal lens could get rid of EITHER your reading OR distance glasses. If your eye has significant pre-existing astigmatism is significant, then you will probably need glasses for far and near regardless after surgery. However ‘premium lenses’ exist (e.g toric, multifocal) which can correct both near and far vision as well as astigmatism, reflecting the function of the natural lens. Patient selection and discussing patient expectations is of paramount importance when choosing a premium intraocular lens. At the time of your consultation, Mr Kashani will go through the list of pros and cons of having a premium intraocular lens in comparison to a monofocal intraocular lens and he will discuss what you may expect after the surgery. It is important to choose the correct lens as ‘lens exchange’ requires further surgery and should be avoided if possible due to surgical risk. What if I have other co-existing eye conditions? Several factors can affect success of cataract surgery such as presence of other coexisting eye conditions e.g glaucoma or retinal disease. Timing of cataract surgery is very important when other eye conditions in particular retinal conditions coexist. Mr Kashani will be able to explain what you can expect from the surgery after the consultation and indeed when would be the best time to operate as the retinal conditions will need to optimized prior to surgery. What are the advantages of having the surgery privately? There are several advantages to having your cataract surgery privately. The most important advantage is that you will have a named consultant surgeon operate on your eye at a time and place that is convenient to you. Secondly NHS waiting list can be as long as 18 weeks and if you cataracts in both eyes then the time will add up which may not be suitable for you. Some clinical commissioning groups (CCG’s) are now placing in thresholds for first and second eye surgery in NHS in order to provide and prioritize the surgery to those who need treatment the most. Although almost all patients with visually significant cataract should still qualify, there will be some who sadly won’t and will have to wait until the vision worsens. Finally the option of a “premium lens” in order to achieve spectacle independence following cataract surgery is only available on a private basis.